Officials are considering proposals for a new operator of the Vern Express as the contract with the current vendor approaches its expiration. The University’s contract with International Limousine Service, which operates shuttles to the Mount Vernon and Virginia Science and Technology campuses, will end this summer and officials have been in talks with both the current operator and other vendors about a new contact and possible changes to the service, University spokeswoman Maralee Csellar said. “In 2017, the University began to engage both the current vendor and other vendors in a proposal process to identify service enhancements and associated costs for a newly structured contract,” Csellar said in an email. She did not elaborate on the possible changes that were discussed. The University has involved both staff members and representatives from the Student Association in evaluating bids from potential contractors, she added. Csellar declined to say when the initial contract with International Limousine Service began, though the company has operated shuttles to the Vern since at least 2004. She also declined to say how many bids have been received and what criteria officials are using to assess proposals. Representatives from International Limousine Service declined to comment. SA President Peak Sen Chua said the SA was involved in helping the University select a transportation vendor after the current contract expires but declined to provide any further details on the selection process, citing the upcoming official announcement. “The SA and administrators agree that important focuses for the next shuttle contract include customer service expectations, enhanced communications about service delays and issues, upgraded buses and the opportunity for WiFi on the shuttles,” he said in an email. 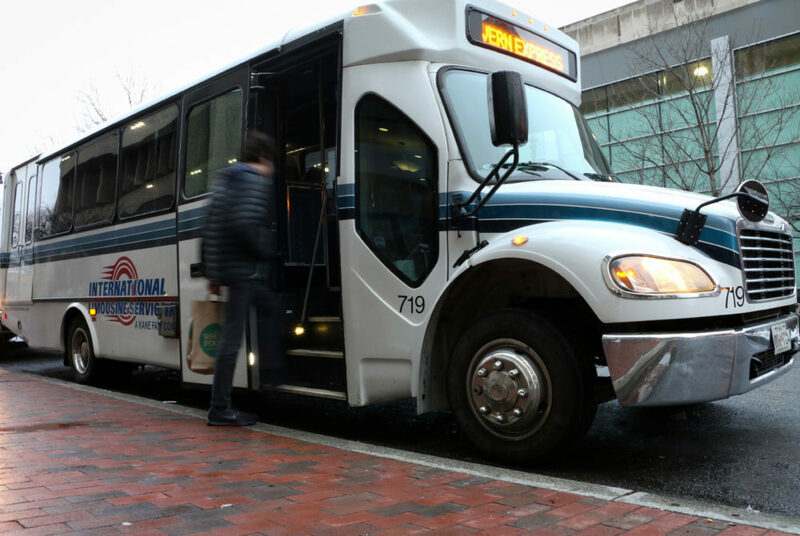 Although it is not yet known which company officials have chosen to run the Vern Express, at least one other D.C.-area company expressed interest in becoming GW’s transportation provider. Ronnie Khanafseh, the account’s manager at Abe’s Transportation, a bus, sedan and limousine provider based in Northwest D.C., said his company is “ready to bid” and is willing to offer services like WiFi in all vehicles, bicycle mounts and a 24-hour helpline for the shuttles. All vehicles will also be handicap accessible, he said. “Students can expect brand new vehicles that are cleaned and checked by our maintenance team before they are sent out,” Khanafseh said in an email.